The Department of Justice (DOJ) is refusing to release intercepted material alleging that former Attorney General Loretta Lynch conspired with the Clinton campaign in a deal to rig the Clinton email investigation, reports Paul Sperry of RealClear Investigations. Not even members of Congress with top secret security clearance have been allowed to see the unverified accounts intercepted from presumed Russian sources in which the head of the Democratic National Committee, Debbie Wasserman Schultz, allegedly implicates the Clinton campaign and Lynch in the scheme. “It is remarkable how this Justice Department is protecting the corruption of the Obama Justice Department,” notes Tom Fitton of Judicial Watch, which is suing the DOJ for the material. 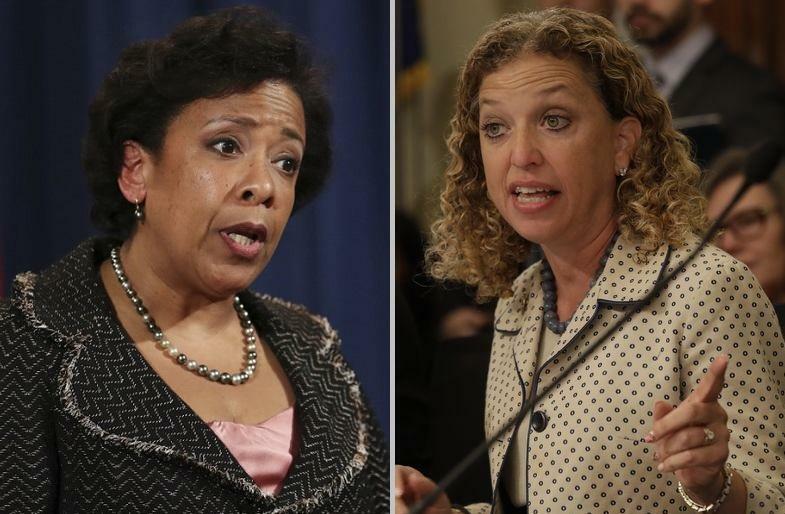 Wasserman Schultz, Lynch and Clinton have denied the allegations and characterized them as Russian disinformation. Then again, if the intercepts are fabricated, it would constitute Russia's most tangible success in influencing the 2016 U.S. election - since Comey may not have gone around Lynch cleared Clinton during his July 2016 press conference - nor would he have likely publicly announced the reopening of the investigation right before the election - an act Clinton and her allies blame for her stunning loss to Donald Trump. The secret intelligence document purports to show that Lynch told the Clinton campaign she would keep the FBI email investigation on a short leash - a suggestion included in the Inspector General's original draft, but relegated to a classified appendix in the official report and entirely blanked out. “The information was classified at such a high level by the intelligence community that it limited even the members [of Congress] who can see it, as well as the staffs,” Horowitz explained last week during congressional testimony in front of the Senate Judiciary Committee, which has oversight authority over Justice and the FBI. Horowitz said that he has asked Deputy AG Rod Rosenstein and FBI Director Christopher Wray to work with the CIA and Office of the Director of National Intelligence to figure out if the intercepted material can be rewritten to allow congress to see it. Once appropriately redacted to protect "sources and methods," said Horowitz, he hopes that members of congress can then go to the secure reading room in the basement of the Capitol Building, called the "tank," and view the materials. “We very much want the committee to see this information,” Horowitz said. For some strange reason, CNN, WaPo and the New York Times have uncritically taken Lynch, Clinton and Wasserman Schultz's denials at face value, dismissing the compromising information as possibly fake and unreliable. Horowitz even quotes non-FBI "witnesses" in his report describing the secret information as "objectively false." While the FBI apparently took the intercept seriously, it never interviewed anyone named in it until Clinton's email case was closed by Comey in July 2016. In August, the FBI informally quizzed Lynch about the allegations - while Comey also reportedly confronted the former AG and was told to leave her office. Comey said he had doubts about Lynch’s independence as early as September 2015 when she called him into her office and asked him to minimize the probe by calling it “a matter” instead of an “investigation,” which aligned with Clinton campaign talking points. Then, just days before FBI agents interviewed Clinton in July 2016, Lynch privately met with former President Bill Clinton on her government plane while it was parked on an airport tarmac in Phoenix. In a text message that has since been brought to light, the lead investigators on the case, Peter Strzok and Lisa Page, made clear at the time their understanding that Lynch knew that “no charges will be brought” against Clinton. The FBI and Washington Post have both investigated this and concluded that the story-line has no basis in reality. It was simply made up by the Russians. While Lynch has never been directly asked under oath by Congress about the allegation - she swore in a July 2016 session in front of the House Judiciary Committee "I have not spoken to anyone on either the [Clinton] campaign or transition or any staff members affiliated with them." 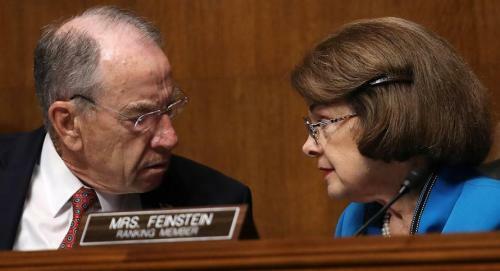 Senate Judiciary Chairman Chuck Grassley (R-IA) says he'll issue a subpoena for Lynch, but the panel's top Democrat Dianne Feinstein (CA) has to agree to it per committee rules. Grassley also said he would be open to exploring immunity for Comey's former #2, Andrew McCabe. Feinstein may be hesitant to sign on, as she says she thinks Comey acted in good faith - which means she thinks Congress shouldn't have a crack at questioning a key figure in the largest political scandal in modern history. "While I disagree with his actions, I have seen no evidence that Mr. Comey acted in bad faith or that he lied about any of his actions," said Feinstein during a Monday Judiciary panel hearing. Former Feinstein staffer and FBI investigator Dan Jones, meanwhile, continues to work with Christopher Steele and Fusion GPS on a $50 million investigation privately funded by George Soros and other "wealthy donors" to continue the investigation into Donald Trump. Of interest, Amanda Renteria is also former Feinstein staffer. Also recall that Feinstein leaked Fusion GPS founder Glenn Simpson's Congressional testimony in January. Lynch was dinged in the IG report over an "ambiguous" incomplete recusal from the Clinton email "matter" despite a clandestine 30-minute "tarmac" meeting with Bill Clinton one week before the FBI exonerated Hillary Clinton. Interesting how a "dossier" full of falsehoods about Trump not only released to the public, but was used by the FBI as part of an espionage operation on the Trump campaign - while an intercepted communication from Russia is suddenly classified as so top-secret that even members of Congressional intelligence oversight committees can't see it.